Nyala Wonder Travel organizes excursions to the Principality of Monaco for the prestigious Rolex Master tennis tournament of Monte Carlo. In the beautiful setting of Monte Carlo, Monaco, a must for all tennis enthusiasts. The travel agency can book an overnight stay in a hotel for you, as well as transfers to the tournament. Arrival in the afternoon at the preselected location and settling into hotel. Overnight stay. 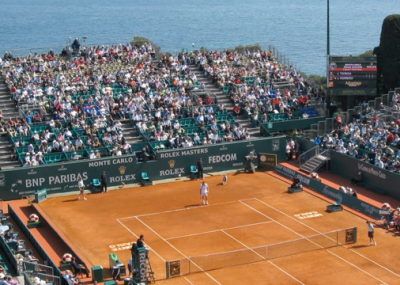 In the morning transfer to the Monte Carlo Country Club where you can experience at first hand a day of great excitement and suspense at every crucial exchange between the finalists of the legendary tennis tournament. For your lunch break, you can visit the restaurant situated inside the village. Return to the hotel, overnight stay. Our offer can be customized to suit your needs, with packages of 1 to 7 nights. Overnight stay in double room, with breakfast in hotel of your choice in Monaco, San Remo, Bordighera, Menton, Nice, etc. Round trip travel, transfers and all that is not included in « Our offers includes ». Lunches and dinners. Beverages and snacks purchased à la carte must be paid for on the spot. Extra nights and half board supplement.